So what’s new with the CNN/White House flap? Monday we showed a clip of a speech given by the President from March 20 at the Orange County Convention Center in Orlando, Florida. Directly behind the President stood a boy of 14 or so bored to tears. While the President spoke, the lad yawned, stretched, yawned some more, checked his watch, took a knee, yawned, and fell asleep standing up near the end. It was a very humorous actual clip we uncovered. Well, CNN played the clip the next day, Tuesday morning, stating that the White House had called and said the Late Show did some editing to the piece and it never happened. Two hours later, CNN showed the clip again and this anchor person said that the boy was at the speech, but was not standing behind the President as we had seen. Dave informs America that neither statement from CNN is true. 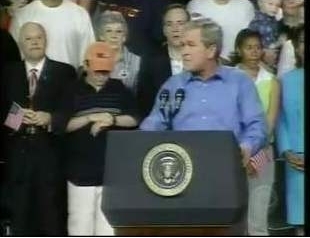 The boy was at the rally and the boy was standing behind the President. Something strange is going on, and Dave smells a cover up. CNN is now saying the White House never called them. But why would CNN say the White House HAD called if the White House never did? Hmmm. And Dave reveals that our source, a very good source, confirms the White House DID call the CNN. Hoo boy, this is getting interesting. While Condoleeza Rice is testifying in front of the 9/11 Commission, perhaps she can shed some light on this as well. Perhaps the White House truly believes the kid wasn’t there due to faulty intelligence. Thanks to my fellow American Street blogger Angry Bear for reporting on this.